To add yet more Indians to my French and Indian War 28mm collection, I’ve turned again to a current favorite miniatures manufacturers — Galloping Major Wargames. After a recent project using GM’s Provincials and supporting their recent French Marines Kickstarter, I filled out a direct order from the UK with a few of their Indian models which didn’t disappoint. GM miniatures are the among the largest in my collection, cast at a 28mm heroic scale. That said, I found my first purchase of their Indians to be just a bit smaller than their other figures I own. The size of the models presents the opportunity for a lot of detail and individual personality, especially in some great facial expressions. These Indians present a more traditional look with chests bared and dress in leather loincloths and leggings. Knives, hatchets, jewelry, powder horns and various shoulder-slung bags equip these figures nicely for any campaign. As a bonus, the six figures I ordered were supplemented with a seventh figure thrown in for free, a nice thing GM offers to larger orders. And with these Indians complete, I’m sure there will be more of those orders to Galloping Major Wargames in my future. In my recent quest to add more variety to my French and Indian War Native American forces, I’ve had to look a bit beyond the usual FIW miniatures manufacturers. My core requirements in seeking new models is that they are metal, a reasonable representation of tribes present during the FIW period and that they scale well at 28mm with my other models. With this criteria in mind, I was happy to stumble across a rack of Knuckleduster Miniatures at a convention earlier this year. Knuckleduster, as the name evokes, focuses largely on an expanding line of Old West themed miniatures in 25mm, 28mm and 40mm scales. Beyond this core offering, they also have a small selection of British, American and Canadian soldiers for the War of 1812. And, it’s within this era’s figures where you will find a small collection of Native Americans usable in the FIW. Packaged as “Grand River Nation” Indians, Knuckleduster offers two packs of six models, one in summer dress and one in winter clothing, plus a two-model leader pack. I picked up the summer dress pack for $10, a pretty good deal for a half dozen metal models cast at a true 28mm scale. These are really beefy models with lumpy facial features but with some nice detail in jewelry and clothing. Their dress generally depicts the European-influenced style from trade goods many Indians wore during the FIW era. And, it is their scale, style and variety that makes these a great hidden find for my Native force collection. With the majority of my core 28mm forces for my French and Indian War gaming complete, I’ve been focusing on filling out my model variety with more Indian figures from a number of manufacturers. The FIW lends itself to having a lot of different Native American models on the table, given the numerous North American tribes which participated in the conflict. Most of my Indians are from Conquest Miniatures distributed by Warlord Games but my next few posts are focusing on some small units I’ve been adding from other makers. First up are a half dozen figures from North Star Military Figures. Until recently, Northstar was manufacturing figures packaged specifically for use with the very popular Muskets & Tomahawks rules set. With a second edition of M&T pending at some unnamed future date, Northstar recently put their figure line on hold. Fortunately I had grabbed a pack of Indian reinforcements at a convention earlier this year. The six models, armed with muskets and hatchets, all come with nice detail of equipment, jewelry and some hooded frocks. I chose to paint them in colorful reds, greens and blues, reflecting the steady trade of European goods during the era. The sculpts are solid with a real 28mm feel a bit larger than my Conquests which stand closer to 25mm. With these Northstar Indians, my native forces have grown in variety and scale as I build out a larger group of allies for my French. The French and Indian War (1754-1763) called for new tactics for old, professional armies steeped in traditional European warfare. With hostilities among French, French-allied Indians and Canadians, British and colonists of all stripes erupting over territorial disputes on the frontier of North America, locally-mustered soldiers were of paramount importance to all sides. Robert Rogers, born in Massachusetts of Irish immigrants in 1731, was key in raising forces in New Hampshire for the British in the mid 1750s on the eve of the conflict. With animosity toward Indians in the region, his recruits formed what came to be known as Rogers’ Rangers. Operating out of Northeastern and Central New York, the company of some 600 men who formed Rogers’ Rangers participated in some of the key actions of the war including the Battles on Snowshoes and the Battle of Carillon, both in 1758. Aside from his leadership during the FIW, he also contributed significantly with his “Rules of Ranging.” Written in 1757, the 28 rules provide an outline for the discipline and tactics which defined Rogers’ own brand of guerilla-style wilderness war. So visionary in their combination of Native American style warfare with some European principles for the rules of war, some version of these have been used by US Army Rangers to this day. Following the end of the FIW, Rogers continued to work with the British military during Pontiac’s Rebellion that swept through the Great Lakes in 1763-1766 and finally during the American War of Independence in the 1770s and 1780s. Despite having devoted his entire adult life to warring on behalf of the British in North America, Rogers died in 1795 poor and in obscurity in England at the age of 63. Robert Rogers has managed to hold considerable space in pop culture for generations. Even though his alliances were with British rule during his decades-long career, his legend rests squarely within a particular type of colorful American frontier character who succeeds by breaking the rules and forging his own path. The persistence of his legacy has been helped by comics, books, movies and TV shows that continue to today. Northwest Passage, the 1937 bestseller by Kenneth Roberts, probably did the most keep the legacy of Rogers alive in pop culture. The book’s popularity led to a 1940 MGM epic starring Spencer Tracy. Nearly two decades later, Rogers came to life anew in a 1958-1959 NBC half-hour show of the same name. This time Buddy Ebsen portrayed the famed ranger during the post-World War II boom in western and frontier pop culture. 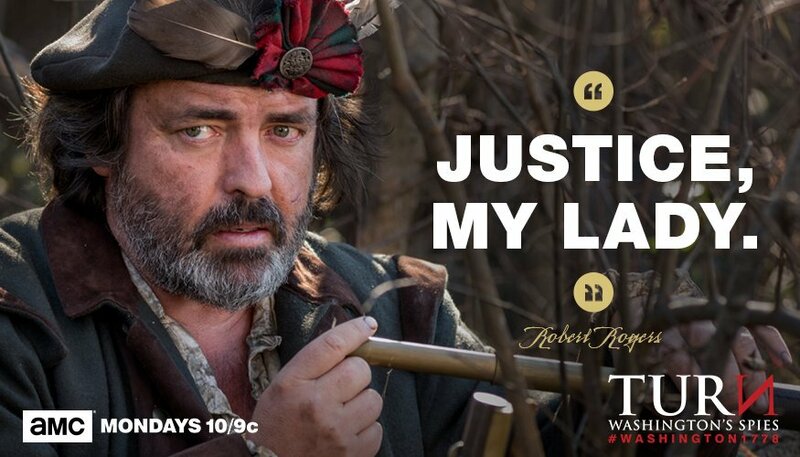 The modern iteration of Robert Rogers appears in the AMC series TURN: Washington’s Spies, now into a fourth season. While the story focuses on the spy network surrounding New York City in the early days of the American Revolution, considerable space is given to Rogers and his complicated relationship with the British a decade after the FIW. For my Rogers’ Rangers, I’ve turned again to Galloping Major Wargames. GM figures, like those I modeled as my FIW Virginia Provincials, have a chunkier heroic 28mm scale I love for their detail and personality. The ranger miniatures offer some variety of irregular outfits and weapons including muskets and hatchets. Headgear include the signature bonnets as well as tricorn and rounded jockey hats with fronts cut and cocked back to the crown and detailed with white edging. The famed short forest green jackets are detailed with lighter green lapels and cuffs finished with silver buttons over earthy red vests. For leggings, I mixed the figures up with colors ranging from a light brown buckskin to a more colorful blue. Together, I feel my painted Rogers’ Rangers typify how they would have looked as they fought in the fields and forests of 18th-century North America. After facing my fear of painting all the details on my first 18th-century British Redcoats, I turned next to North American Indians and another challenge – painting lots of flesh. Getting Indians in the mix with my French and Indian War gaming project was key, and my focus on the era of the Braddock Expedition and the Battle of the Monongahela meant I was going to need lots of Indians. In addition and since both the British and the French allied with different tribes throughout the war, I was going to need a fair amount of variety from the figures I chose. As I entered into modelling my first North American Indians of the 18th-century, I went to two books. Jill Lepore’s The Name of War: King Philip’s War and the Origins of American Identity (1998) focuses on how warfare in New England in the 1670s shaped the mindsets of European settlers as well the native people they encountered. In a follow-up of sorts, Our Savage Neighbors: How Indian War Transformed Early America (2007) by Peter Silver picks up this thread in the Mid-Atlantic colonies of the 1700s as multiple nationalities and ethnicities of Europeans again ran up against a population of natives set on halting the expansion of these new arrivals. Both books are remarkable and still ring as relevant to this day as fear and violence remain a cultural and poltical driver as we Americans continue to grapple with new cultures of people looking to share space. With a bit of reading under my belt, I was fortunate to have a fellow member at Metropolitan Wargamers in Brooklyn, NY who had piles of extra Indians from Conquest Miniatures sitting in a box. These metal cast models are now carried by Warlord Games in both boxed sets like the Woodland Indian War Party and in smaller packages. From my friend’s stash and without duplicating poses, I was able to pull out a couple dozen different models to build my initial Indian force. The models show a lot of unique personality and equipment with both traditional weapons (bows, war clubs, knives and hatchets) and European guns. The mode of dress also varies, with some figures wearing only the minimum of a loincloth and leggings while others are in long-sleeved shirts. As per my usual process at this scale, all the metal was cleaned up, the figures were based on washers and the bases were filled in roughly with wood putty. After a black spray coat, the first challenge was in finding a proper flesh tone to represent Native woodland Indians of northeastern North America. I read a lot online debate on how to capture the skin tone of a varied people, so I settled on a two-part process of my own. Over the black primer I applied a first coat to exposed skin areas using a 50/50 mix of red and dark brown paints. As the paint was drying, I immediately noticed the skin was a good dark color but translating as overly red even at arm’s length. In order to preserve the richness of the color while also tempering the bright redness, I gently dry brushed a coat of light brown over all the skin areas again. Once dried a second time, I felt I had a fairly decent tabletop rendition of skin tone capturing the creases, shadows and shape of the bared muscles without tipping into caricature. As opposed to the sameness of European uniforms of the FIW period, the real fun in painting these Indian models is in the imagination that can be put into them. Not surprisingly, there’s not much of a detailed historic visual record of exact modes of dress for Native Americans of this period. With that, I let my creativity reign. Most leggings, loincloths and satchels got a basic leather brown color with fringe highlighted in slightly lighter brown. Jewelry such as necklaces, earrings and bracelets got a mix of metallic and red, blue or green colors to represent precious stones or trade beads. Since decoration was very prominent with most tribes of the Northeast, all bags, leggings, belts and other gear got a mix of geometric patterns applied to represent this native craftsmanship. Detail also extended to some of the flesh on the models, with most receiving body paints or tattoos in red, dark blue, black and white. In the end some of the figures wound up with their arms, heads or even entire torsos covered in paint. While half the models carried the look of their native cultures, the other models sported more European-style clothing with long shirts, blankets and leggings, all of which were done in various colors. I especially liked one figure who seems to be striding along proudly wearing a captured British red coat. With everything painted, the bases were finished with Green Adirondack ground cover from Scenic Express. My first two dozen completed Indians wound up dividing nicely into two groups of twelve. This will make them easier to identify as diffrent units on the same side or different tribes altogther choosing to swing their aliance to the opposing British and French. 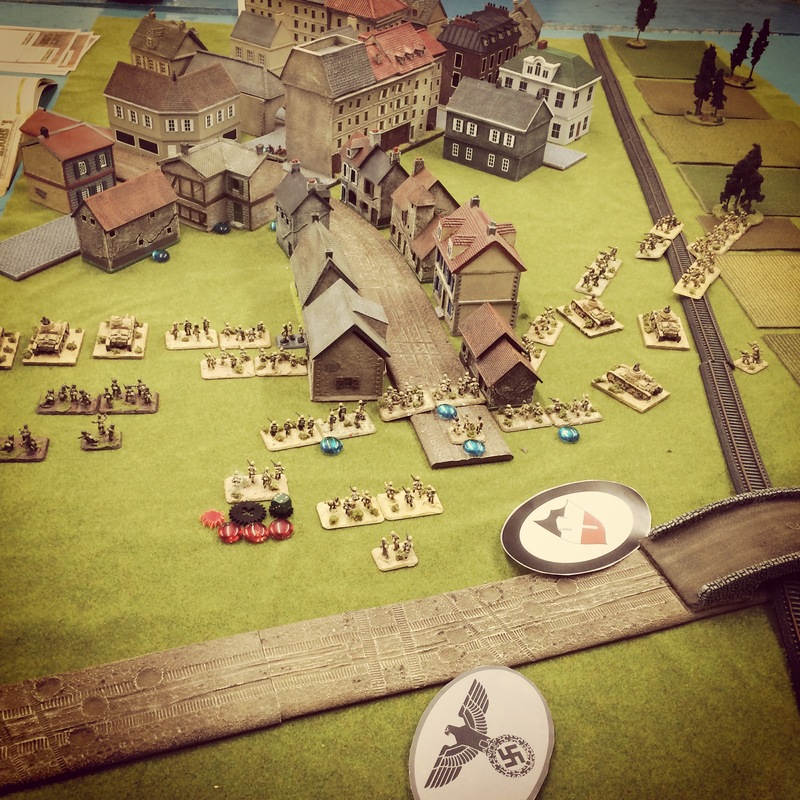 We continued our play through Operation Husky and the invasion of Sicily in July 1943 this past weekend at Metropolitan Wargamers in Brooklyn, NY. 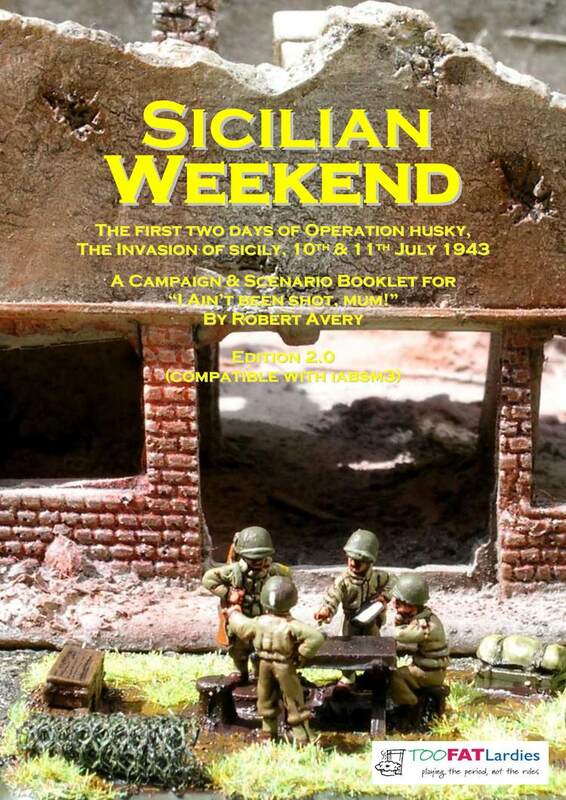 We’re working our way through the events of July 11th in the Sicilian Weekend book by Too Fat Lardies for their I Ain’t Been Shot Mum rules for 15mm World War II play. 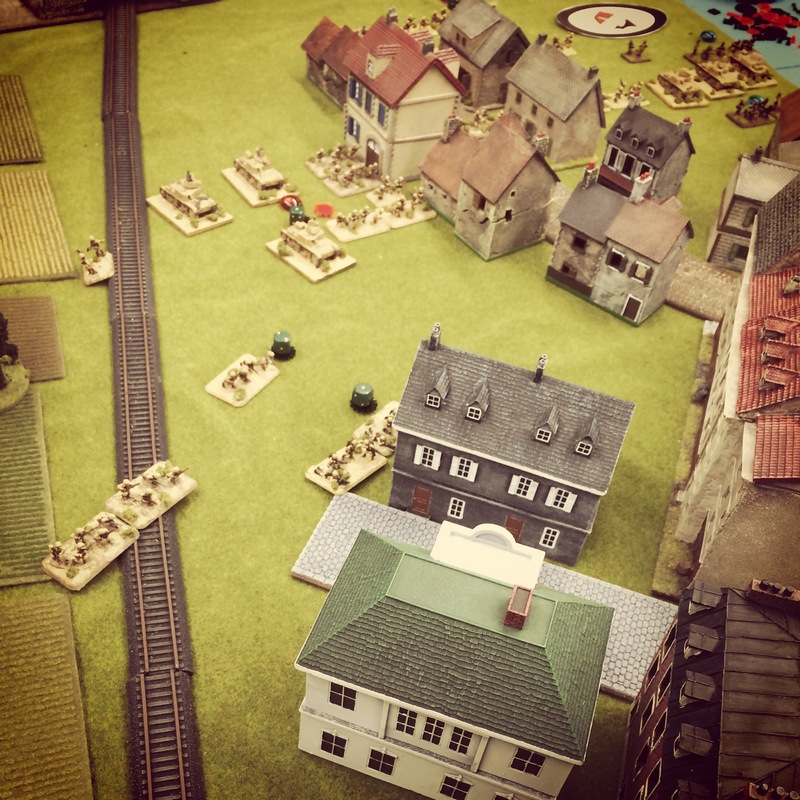 The scenario represents the northeast section of the town of Gela where ferocious fighting had taken place the day before in the early actions of the Allied invasion of Sicily. 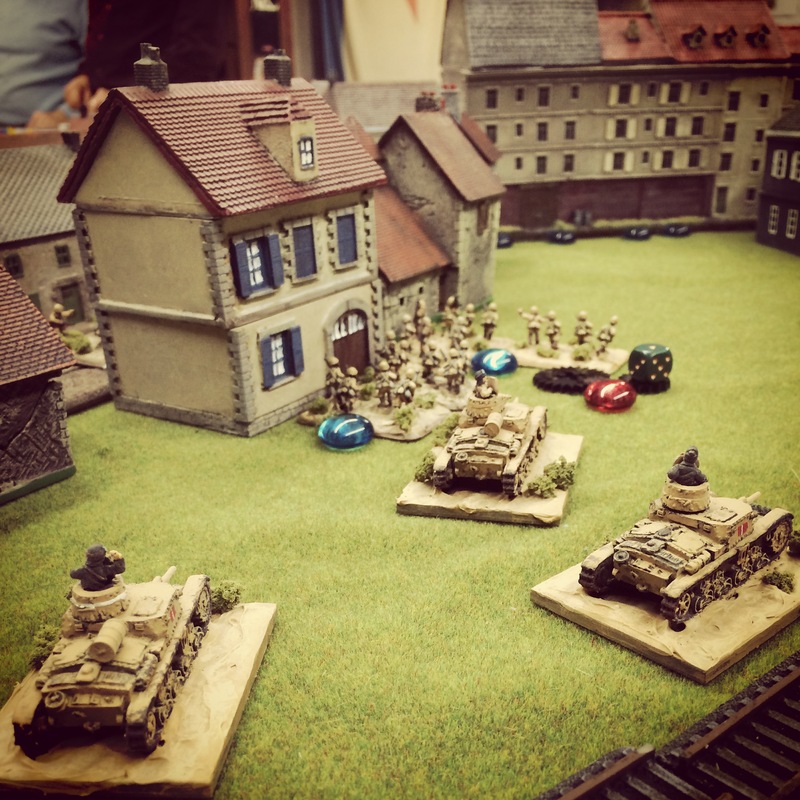 The table was set up with a couple dozen buildings from a variety of manufacturers, including JR Miniatures, Battlefront, Mark IV Miniatures, Miniature Building Authority and Games of War. The occupying US troops all began hidden in Gela with the Italians arriving on blinds at the opposite end of the table over a small railroad cut, bridge and road surrounded by open farm fields dotted with trees. 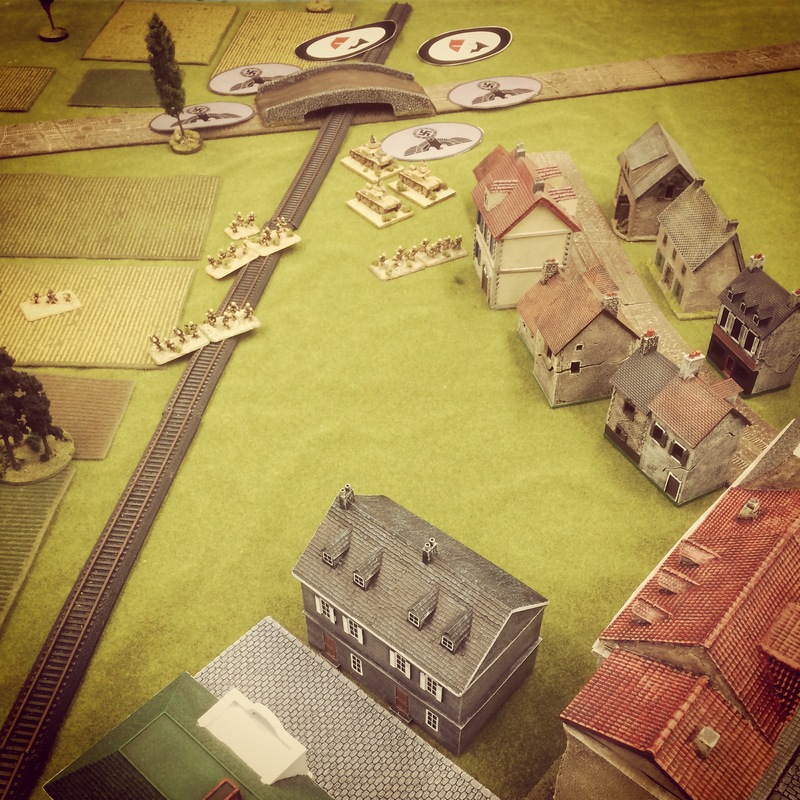 The objective was simple: the Italians had to take back this corner of Gela and the Americans had to hold what they had fought so hard for the previous day. The Americans deployed in well-defended positions in the town with two platoons of rifles and light machine gun squads perched in buildings. A combat engineer platoon armed with a 37mm M3 anti-tank gun in tow sat hidden along the main street through town. Off board, 4.2 inch M2 mortars and 105 mm M2A1 howitzers from the 33rd Field Artillery Battalion were available as support to be called in by the captain from the company HQ perched in the tall building at the center of town. 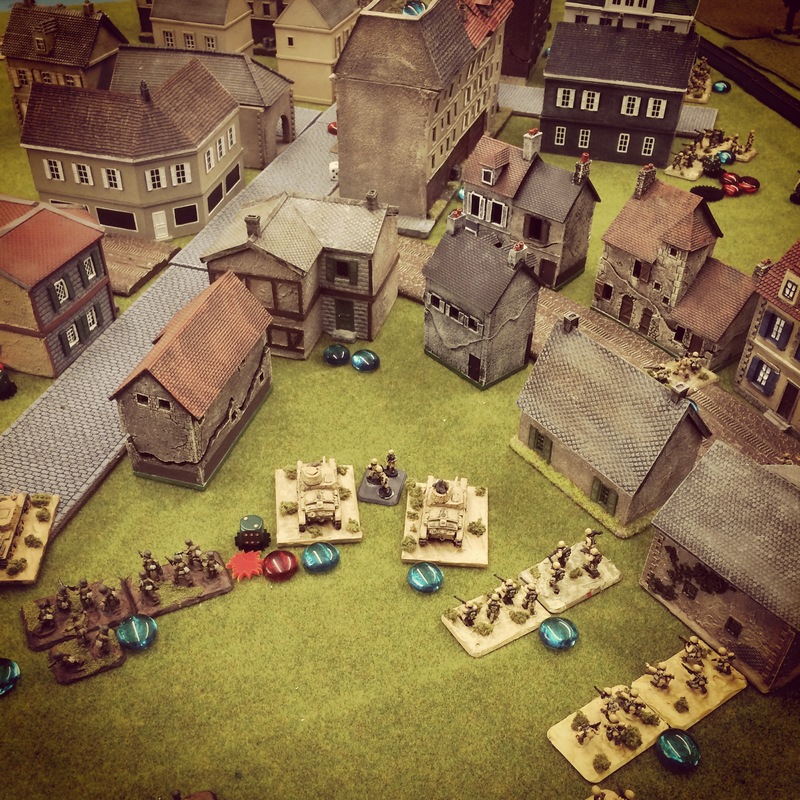 Tough and dug into great positions, the Americans looked to have a clear advantage. 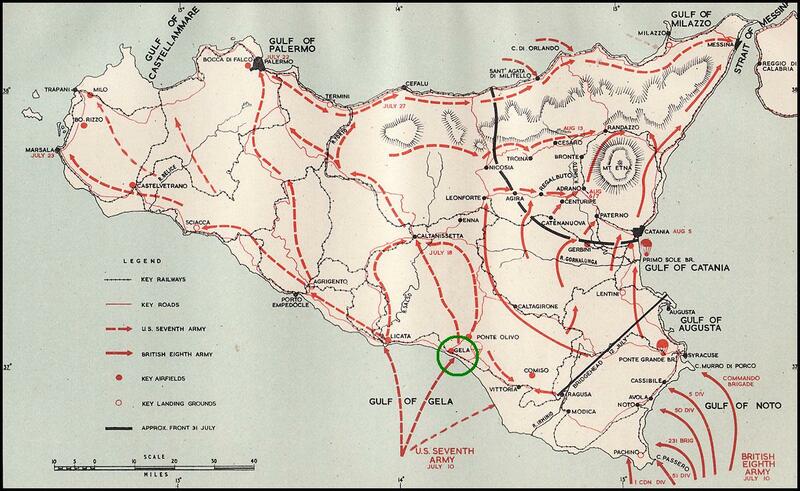 As in the previous scenario southeast of Butera, the Italians again represented a massing of manpower from the Livorno Division with six small rifle platoons and a machine gun support platoon. Accompanying them this time was Mobile Group E compromised of light French Renault R35 tanks and pre-war Italian CV33 Tankettes. 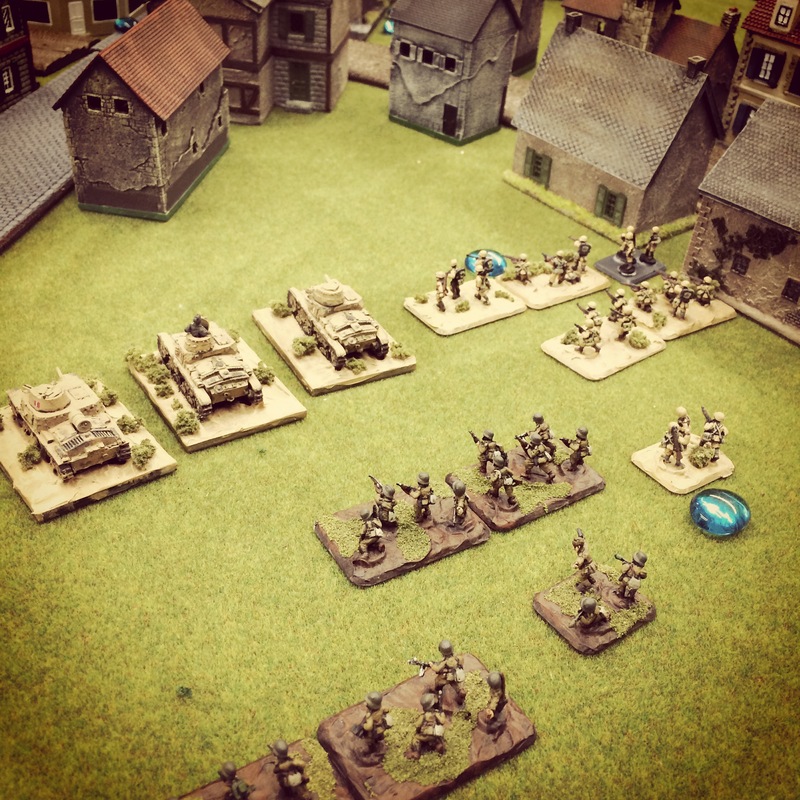 What the Italians lacked in a starting position on the field and quality of equipment and troops, they certainly made up for in volume as they began the game arriving on three blinds per turn. As the Italians neared the town, the Americans bided their time and sought not to reveal their positions until the approaching forces were nearly on top of their positions. Approaching in the open, the Italian blinds were spotted in the open to reveal tanks and infantry closing in at the center and edge of town. With IABSM’s randomly card-activated units mechanic, my US commander was perhaps overly cautious in waiting a turn or two too long to start getting the American cards into the deck. This all but negated off-board US artillery support for the game and allowed the Italian attackers to get dangerously close to seizing a quick victory with nary a shot fired. On the Italian left, one of their early shots fired down the street took out a crew member of the M3 anti-tank gun, forcing the remaining American crew to haul it back around a corner to safety. In answer, the US engineers opened fire at close range and threw back the initial push by the Italians on the American right. At the center of town, US rifles, machine guns and bazookas firing from within a massive central building ripped into the Italians marching forward in the open. Under heavy fire at their center, the Italians fled for cover to either side as their approach was slowed and their returned rifle and tank shots had little effect on the Americans. 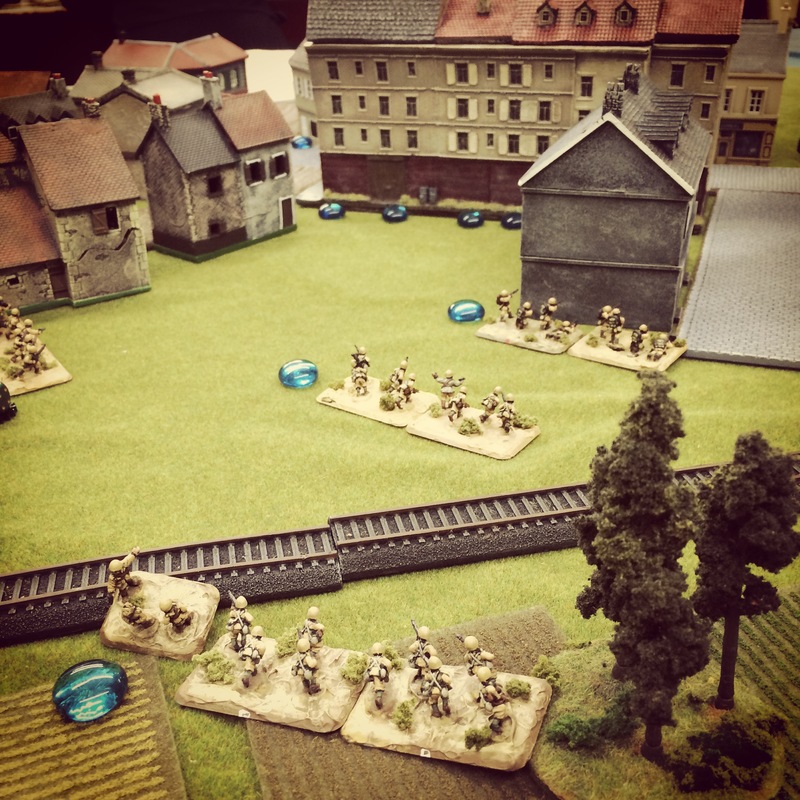 With nowhere to go but forward, an Italian rifle platoon at their left assaulted the US engineers holding down the American right from a building. The Americans took heavy casualties and were thrown backward from their position into the open street to the rear. In response, returned fire from engineers in a nearby building flung the Italians back from their brief victory. Back at the center, another round of combined arms fire from the Americans in the large central building continued to feed shots into the Italians, forcing them to continue to slide into cover to either side of the open field outside town. 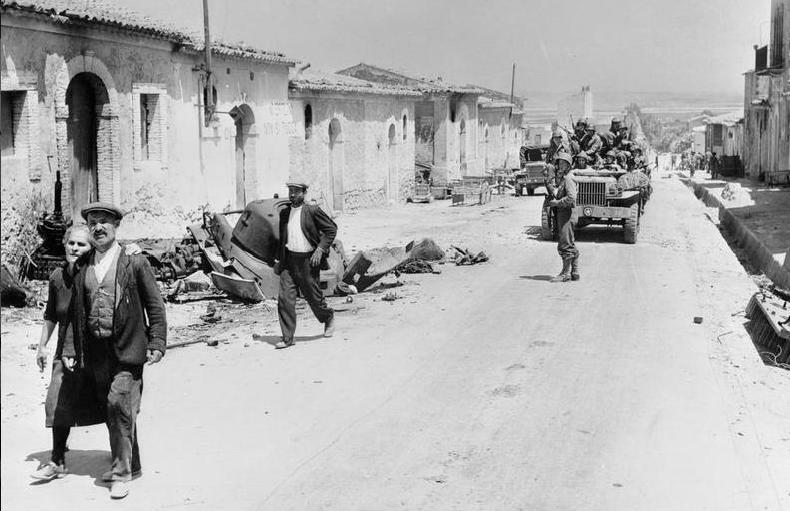 While pushing the Italians back with casualties and shocking fire provided a short-term positive for the US, it also allowed the Italians the chance to redeploy and set themselves for a move into town on the American left. Meanwhile on the US right, the surviving engineers were chewed up by additional fire in the street which stalled them out of the action. With the main street into town wide open, the first Italian tank positioned itself to roll down the cobblestones. 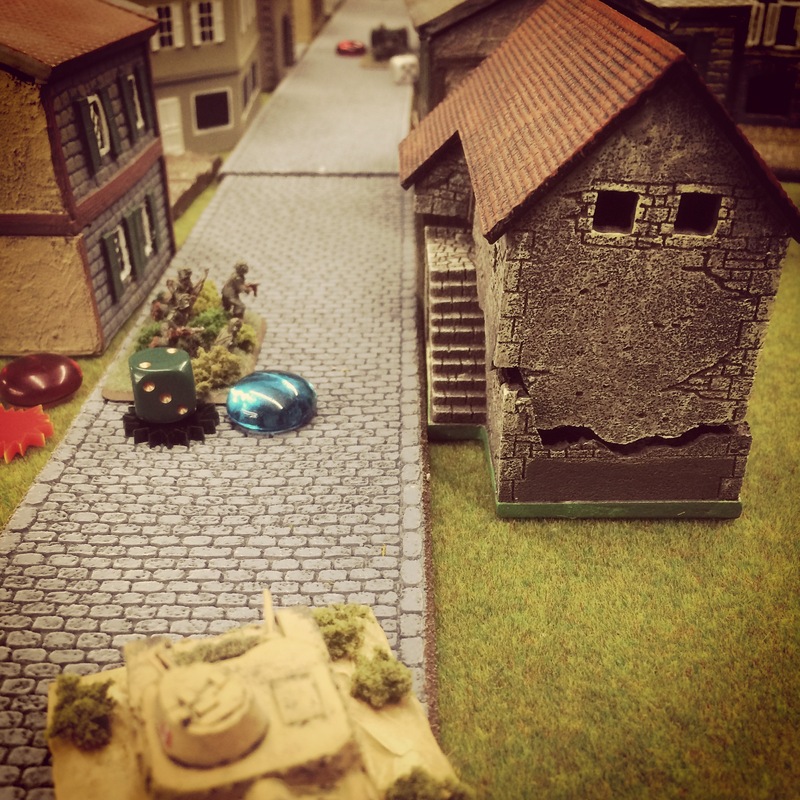 Waiting in the distance was the American anti-tank gun with a clear field of fire down the street looking to stave off an armored assault into the heart of Gela. With the Italians abandoning the center, the fight moved to the flanks. 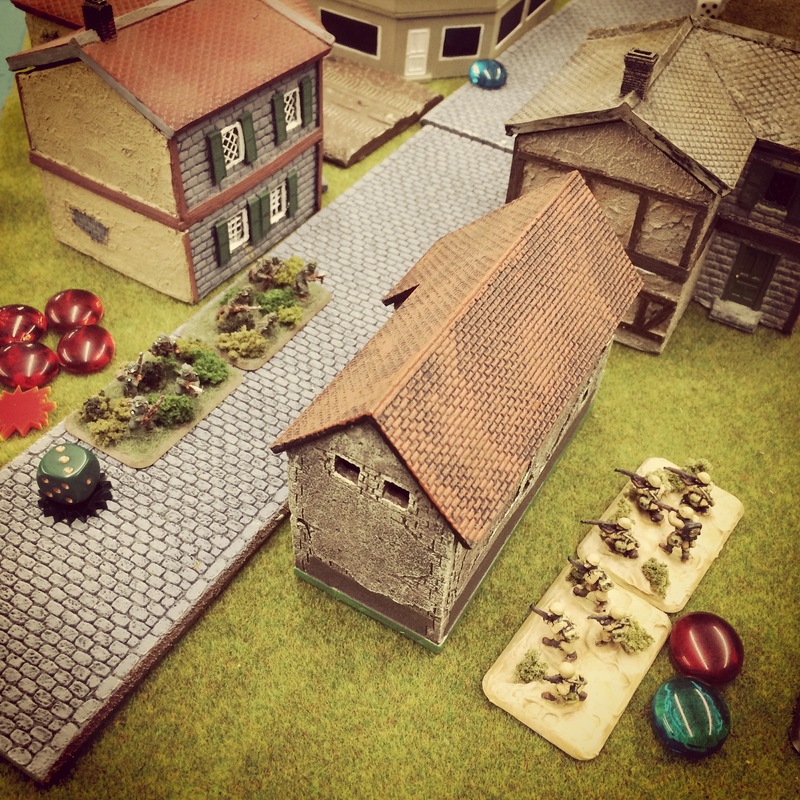 One US rifle platoon moved to reposition into buildings further to the edge of town on the American left as two Italian platoons, one already having suffered heavy casualties, snuck between buildings for cover. The American engineers on their right sought to hold down the approaching Italian tanks and three rifle platoons, and the US anti-tank gun crew had yet to fire a shot. The American rifles, machine guns and bazooka crews who had caused so much damage at the center were facing a choice of redeployment as their Italian targets skirted to either side. Several hours in, we called the game. The small-scale tactical nature of IABSM is highly contingent on when a platoon or command ‘big man’ card activates. With so many Italian cards in the deck, a run of activated Italian unit cards may have provided the push they needed to get to the main street and victory. That said, each US card drawn was continuing to have devastating results on the somewhat weaker Italians, causing casualties and flinging them into reconsidering different routes. The large number of Italian on the field were still poised to match up with the higher quality American troops, although the US had clearly blown an early opportunity to use their off-board artillery effectively. Good and bad command choices had left Gela contested for the day. I wound up spending a fair amount of time this past year touring sites related to the French and Indian War period while feeding my gamer’s appetite for the Seven Years War period with A Few Acres of Snow. With a little research and talking with some of the members at Metropolitan Wargamers, I decided I needed to go bigger and dive into a game focused on the French and Indian War. All trails led to GMT’s Wilderness War, and I had a chance to play my first game this past weekend. Published in 2001, Wilderness War is a game that causes a lot of the gamers I know to glaze over with wide grins. The game is designed by Volko Ruhnke and uses a card-driven mechanic much like his COIN games series also published by GMT. I have a few games of the Runke-designed Cuba Libre and Fire In The Lake under my belt, so I knew that a French and Indian War game from him was certain to be a mix of relatively simple rules wrapped up in a rich historic board game experience. The gorgeous map – hardbound in the latest edition – presents the Northeastern colonial areas of North America in the mid 18th-century. As with the war itself, the game is largely defined by geography. “Cultivated” (ie settled) areas are indicated with boxes, and “wilderness” areas and Indian settlements are printed as circles. Mountainous areas are also depicted with chains spreading through western and central Pennsylvania, the Hudson Valley region and portions of central New England. Connecting these areas are roads or trails and the more important waterways which served as the superhighways of the period. Many of the larger cultivated settlements begin with heavy fortresses protecting the space, while the game set up places a series of French and British forts and stockades throughout the map. Game components consist primarily of 70 cards and 271 cardboard counters. The counters generally depict movement and combat ratings, with reduced values on the flip side once a unit takes damage in battle, during a wintering period or from an event card. Command markers also carry tactics numbers, which help during combat, and a command value. Cards allow activation of units equal to the number printed or by command rating. Special events may also be played for British (red), French (blue) or either side (red/blue), and cards with a brown-red band are events which may be played at any point during either side’s actions. The game plays with year-long turns each containing an early and late season, each approximating about six months of time. In each season, players begin by being dealt eight cards apiece. Later events and actions may modify a player’s hand size, but in general the French and British player then take turns playing cards to move forces, engage in battle, construct defenses or play out events as depicted on the cards. With some pre-planning, each season moves relatively swiftly toward the conclusion of a year of war. At the end of each year, victory points are tallied and units are checked to see if they suffer losses during the winter period between each yearly season of fighting. 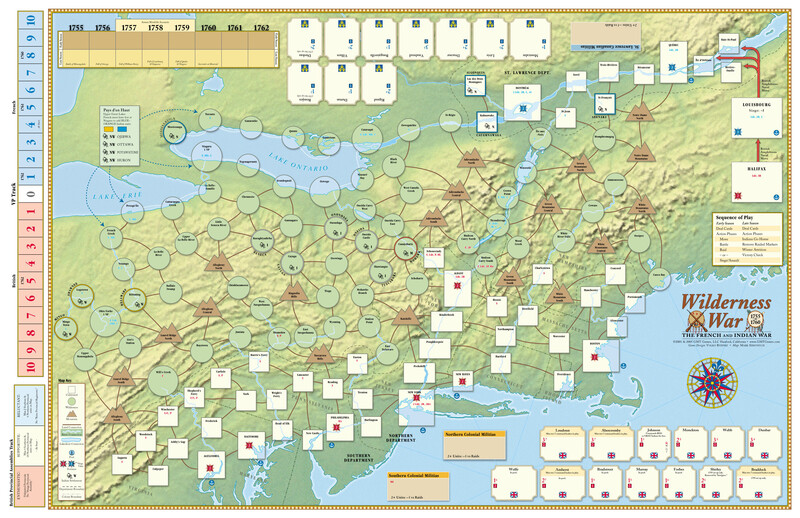 Wilderness War comes with a playbook outlining several small to mid-sized games featuring particular periods in the war or a set-up for the entire war from 1755 to 1762. 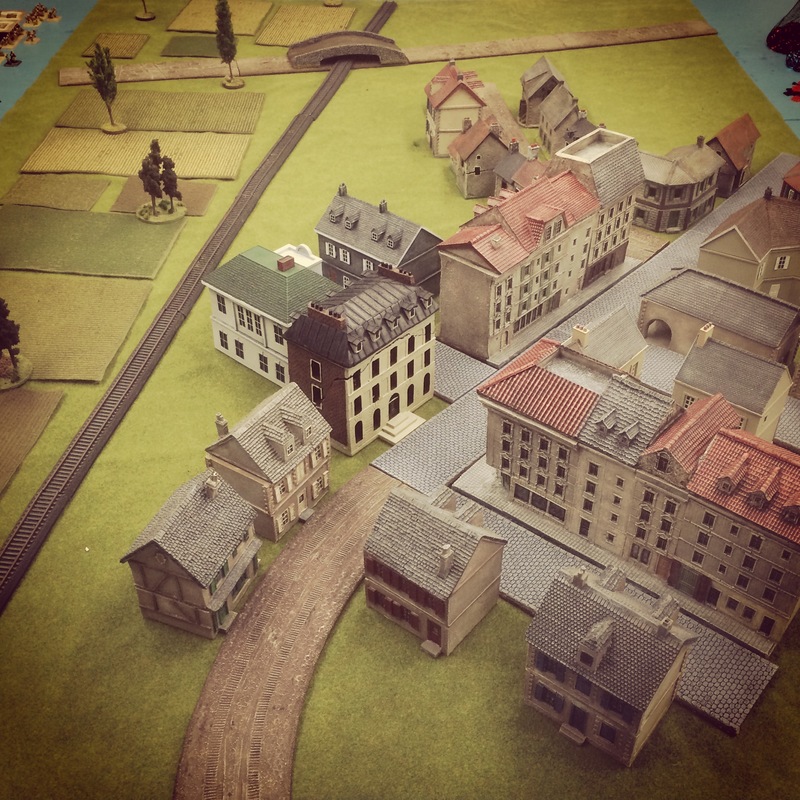 For my first game, we jumped in with both feet and started from the outset of the war with me playing as the British and my experienced opponent using the French. The French begin the game with a small force stretched across the Lake Ontario, St. Lawrence River and western Pennsylvania regions. British forces start poised on three fronts along the Hudson River, stretching west toward the eastern tip of Lake Ontario at Oswego and just south of western Pennsylvania. The French are buoyed with their strong alliances with several Indian nations while the British hold enormous access to colonial, regular British troops and numerous commanding officers waiting to be called into service. Using the swift wilderness movement and raiding capabilities in the 1755 and 1756 turns, the French sent Indian forces into Pennsylvania, Virginia and New England to raid unprotected British cultivated areas. The British quickly moved to redeploy their meager regulars throughout these areas to build stockades and push back further raids. At the same time, the French massed their forces and captured Fort Oswego. By the end of the second year of play, the French were already sitting on six victory points. With a string of stockaded defenses set up to the west by the beginning of 1757, the British began to land troops at their coastal port arrivals to offset negative British political effects which stymied the use of more Colonial regulars and militia units. British troops commenced the long march into the Pennsylvania mountains and the nearby target French fort at the Ohio Forks (today’s Pittsburgh). Back to the east, the French began using their new base at Oswego to launch a push to the southeast into the Hudson Valley and the ill-defended areas around Albany, Schenectady and the Oneida region. All the while, the French continued to recruit additional Indian forces to buffer their defenses at the Ohio Forks and continue raids toward the east. The 1757 late season ended with my leaving too many British marooned in the mountains of Pennsylvania in a clear rookie mistake which led to my mass of troops taking heavy losses in the winter season. By 1758, my British luck seemed to change a bit for the better. Drawing and playing the William Pitt event card, I was able to increase my card hand size to nine cards and gain access to more British forces. Rushing more British reinforcements west into Pennsylvania, the French fell during a siege at the fort protecting the Ohio Forks, giving the British a firm foothold on the western frontier and awarding two victory points. Additional British troops rushed up the Hudson River Valley to hold back the French push toward Albany. As the British remained engaged in fights, the French began shifting their forces along Lake Ontario and the northern frontier while also raising a large force from the Iroquois in central New York. With 1758 at an end, my British forces were safely wintering on two fronts but in a severely weakened state and still way behind on victory points. Defend the frontier. Especially for the British, but for both players, keeping the frontier defended by building stockades and forts is a must. Regular troops caught in wilderness areas are easy targets for Indians and other non-regulars, so having defenses built is key to defending territory. Having a network of stockades and forts to defend from, retreat to and maintain supply line coherence is a necessity if an army is going to succeed in the wilds of North America. Don’t get caught out in the cold. Open country and mountains are a strong enemy, particularly to 18th-century European armies. Paying attention to stacking limits as each year ends is important to keeping a force at strength. When conducting operations, players need to keep in mind where their troops will all wind up as a year ends and forces settle in for the winter. Nothing is worse than spending a series of turns marching troops into position only to have a portion of them die from starvation, disease and exposure in the period following each year’s turn. Play the long game. 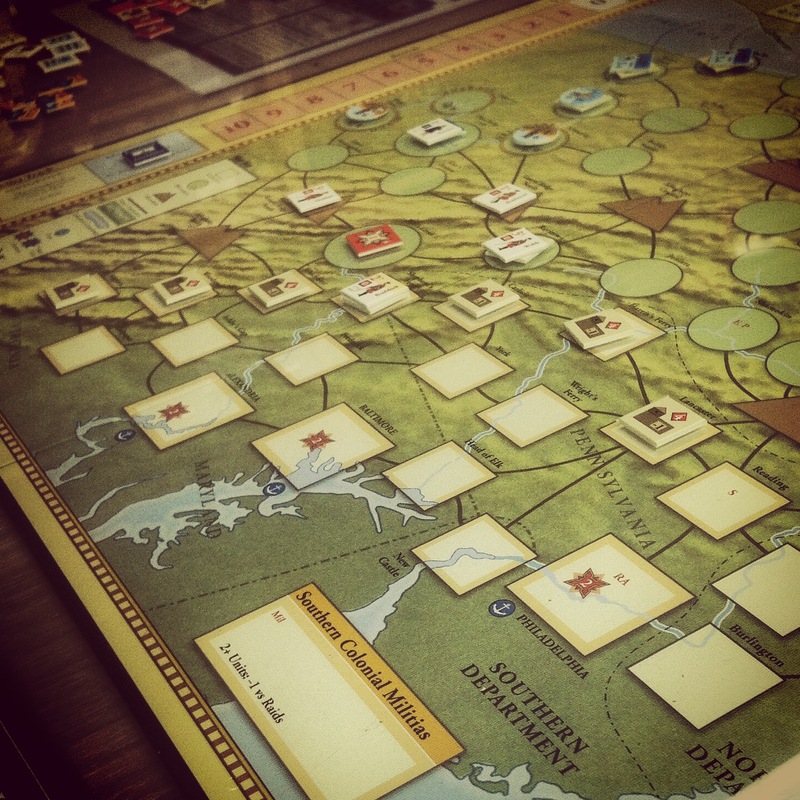 The full game goes to eight years of warfare, so strategy needs to take a long view. The first half of the game most probably belongs to the French as they and their Indian allies sack the wide open and undefended frontier. The British simply can’t be everywhere in the early years of the war, so spending time building defenses while also waiting to get the right cards to call in reinforcements is important. Massing and moving large forces on both sides to be strong enough to siege and capture forts takes a fair amount of planning but pays off in victory points. 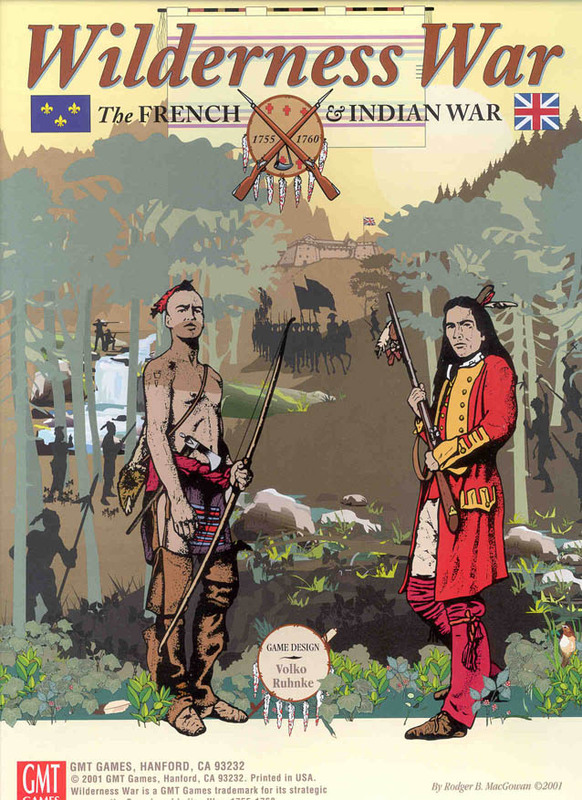 Wilderness War is a fantastic playable document of the French and Indian War. The shifting alliances, opportunistic events, geography of the country itself intertwine to capture the period with a realness that might be familiar to any French or British commander on the 18th-century American frontier. Random musings one J at a time. Wargaming. Beer Drinking. Because War Is Ale.